Thank you all so much the event was a success! Take a Look at this years event!! Thank you to Susan Fried, Ron Johnson and the rest of Community for these Wonderful Photos! We have succeeded! We created one of our largest events to date! We had 2 inspirational rallies before and after the march of over 2000 community members! Garfield High School for a community meal. Our colleagues in the Initiative 1000 campaign to restore Affirmative Action submitted more than 387,000 signatures to the secretary of state’s office, well over the number needed to qualify the initiative. The Legislature can now approve the measure or send it to the voters in November. We will continue to support this Initiative to help get equal opportunity in education, jobs, and contracting. Every year we aim to create tangible change in our community! This year we are backing I-1000 which would redefine affirmative action in Washington, providing equal opportunities through recruitment, hiring, outreach, training, goal-setting and other methods designed to increase diversity. This year the Seattle MLK organizing Coalition is ecstatic to partner with “Seattle Womxn Marching Forward” we are co-organizing a weekend of marching, rallying, workshopping, and healing, to help us all renew and plug in to the resistance. Take a look at their site here. *Womxn with an “X” includes anyone who considers themselves a woman, and all non-binary / gender-non-conforming folks. Learn more here. Our workshops & speakers will focus on our theme - and the goals of the Dr. Martin Luther King Jr. - defeating racism, poverty, and war! Want a say in designing Seattle’s 2019 Martin Luther King, Jr. Day (MLK Day) march and celebration? Join our planning team and share your great ideas, friends, and energy! The coalition (and committees*) are open to all people of good will who honor the goals and methods of Dr. King. 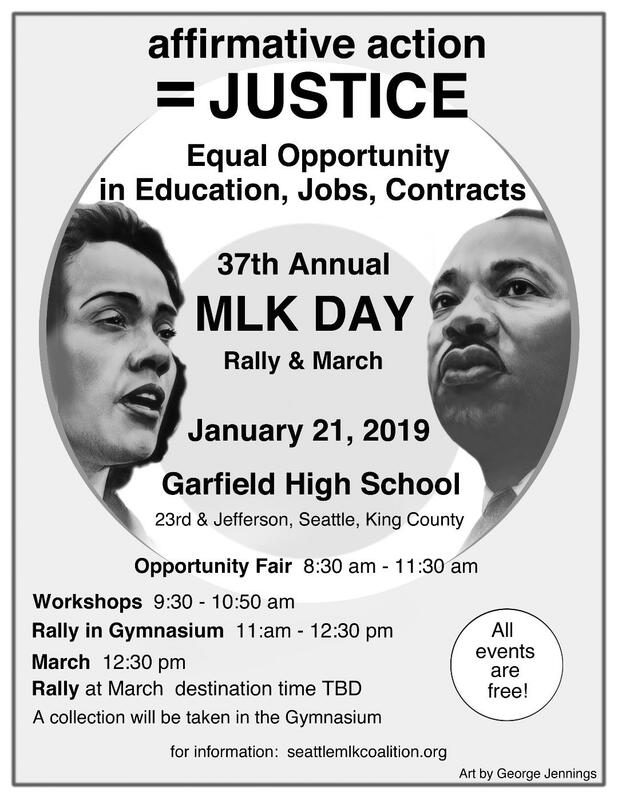 The 37th annual Seattle MLK Day events at Garfield High School happens on Jan 21, 2019. Our meeting schedule can be found here , with meetings typically 6:30-8:00 pm, at Seattle Vocational Institute Room 401, 2120 South Jackson, Seattle. We welcome anyone who wants to work in a democratically operating organization! Hundreds of volunteers contribute to the success of our events. Learn more about how you can help and sign-up. We will send you updates on the event, meeting dates/times, opportunities to participate, and more. Our event’s success can only be attributed to the help the coalition receives from people like you! This is a community planned event and even if you can’t help the day of a donation is great way to give back. It is with heavy hearts we dedicate the 2019 march to the memory of two trailblazing Sheroes. Since the inception of the Seattle MLK march and rally these leaders have been key in bringing diverse organizations and community members together to create an all inclusive event that fostered legislative change. From chairing different sub-committees to increasing participation from the community they supported the coalition in so many ways! Verlene with Governor Inslee working on increasing voter turn out. Miss DeCharlene, who was the founding President and CEO of the Central Area Chamber of Commerce, was the owner of DeCharlene’s Beauty Shop & Boutique; and Barber College. She also co-founded the Central Area Youth Association (CAYA), Seattle Medic One in 1969 (a service that saves lives with pre-hospital care), was an accomplished author of two books on the Seattle Central District and created/hosted the annual Juneteenth event at Pratt park. A beloved labor leader, Verlene served as President of the Seattle chapter of the A. Philip Randolph Institute, President of the Washington chapter of the Coalition of Labor Union Women, and Director of the MLK Labor’s Union Cities program. She was always active in her union - Office and Professional Employees Local 8 - where she served as President for 10 years. She served as WSLC Vice President, representing CLUW on the council’s Executive Board, since 2017. We are only covering the surface of these women’s’ impact on the Seattle Community! Without their leadership and passion, Seattle would not be the community you see today. Like everyone who has been touched by these wonderful SHEROES, we will forever love them dearly and always be thankful for their efforts. Every year we try and capture all of the great moments at this event. This year we are starting a photo gallery to show you all, what a wonderful community looks like! A legacy of working for justice in the Seattle/King County area. Each and every year we aim to get at-least one more person at the rally. In the hopes that one day we have every single person in the state! Every year we are supported by the generous donations of our community.